With over 30 years’ experience as a Tour player and a designer I bring you the finest wedges, shaft and grip in golf. I worked tirelessly to develop the milled chrome plated, hand crafted 305 Blue Series and 405 Dimple Series wedges. My designs have been inspired by my lifetime of working and designing clubs for the best players in the world. My milled face and perfect bounce will give you the confidence to hit any shot you desire from any lie. Every single Harry Taylor Series 305 Blue Series and 405 Dimple Series wedges come standard with the very best components in golf. The High Quality Steel shaft is the perfect compliment to the 303 stainless steel heads. This high-flex, tour-weighted shaft allows for a penetrating trajectory at a moderate swing tempo. With the Steel shaft, you can maximize the benefits of the Series 305 Blue Series Wedge head which is designed to provide the very best accuracy to your short game. The Tour Quality Rubber grip is by far the most popular grip in the game today. With the non-slip pattern, sweat and moisture won’t reduce comfort or accuracy. Combined with the High Quality Steel shaft and the most carefully designed wedge head, you can play confidently and comfortably for the full 18 holes. I have designed many wedges in my career and I think the Harry Taylor Design series 305 Blue Series wedges and 405 Dimple Series wedges are the most beautiful best performing line of wedges I have ever produced. For the best design of my life, only the very best components will do. 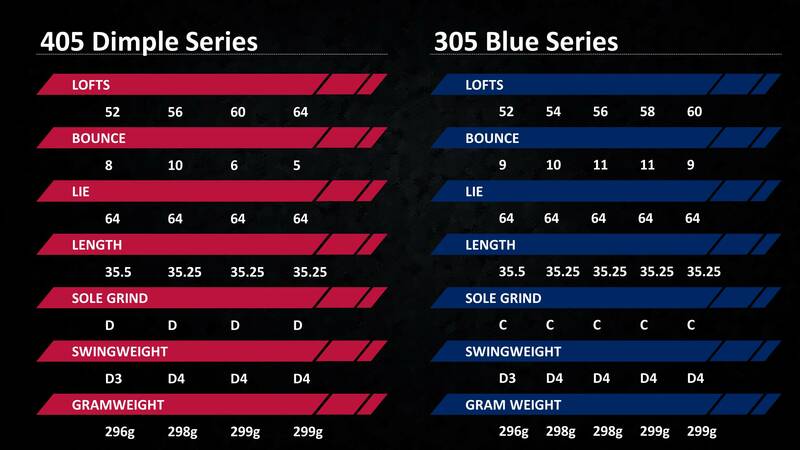 All the grooves on the face of the Harry Taylor 305 Blue Series and 405 Dimple Series wedges are 100% inspected U-shaped grooves that create a more consistent spin off of the face.